Home Education What Does the Future Hold for the Fast-Growing Outdoor Recreation Industry? What Does the Future Hold for the Fast-Growing Outdoor Recreation Industry? MILWAUKEE, January 15, 2019 – For the first time ever last year, the U.S. Bureau of Economic Analysis recognized the outdoor recreation industry separately while calculating U.S. gross domestic product. It found that the industry contributes an incredible 2.2 percent of the nation’s GDP with $734 billion in annual gross economic output. Jack Uldrich, a best-selling author, and international speaker on emerging trends will be sharing his insights on the future of a variety of outdoor activities in this important industry today, including camping, fishing, boating and kayaking, and scuba diving. He will be speaking to leaders with Johnson Outdoors, a leading producer of outdoor recreation equipment based in nearby Racine, WI. A well-known recreation and outdoor sports futurist, Uldrich has addressed numerous recreation-related associations and other industry organizations, including The American Sports Fishing Association, The Recreational Vehicle Industry Association, and the National Sports Shooting Foundation. Uldrich believes that the future of recreation is being reshaped by rapid advancements and in his presentation today he will highlight specific technologies and how they could create opportunities for outdoor recreation. For example, new higher accuracy GPS satellites could one day help hikers and other outdoor enthusiasts go further into large parks or bodies of water without ever losing track of their exact locations and route back. An avid outdoorsman, Uldrich partners each summer with fellow Minneapolis-based consultant and speaker, Jeff Appelquist to lead groups of executives “Into the Unknown” by following the trail of famed explorers Lewis & Clark. Throughout the experience, they learn lessons in leadership based on that historic journey. 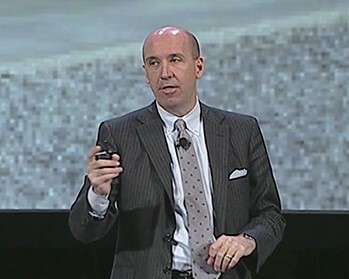 According to Uldrich, “The work I do is all about helping organizations prepare for the coming technological changes so that they can effectively navigate and determine the course of their future.” When it comes to future-proofing, he says the first thing organizations need to do is to acknowledge that the future will be different — perhaps radically different — than the present. Internationally recognized for his engaging presentations and his insights on the potential impacts of emerging technology, Uldrich speaks over 100 times each year and has presented his message to global leaders on five continents. His client list includes the National Association of Manufacturers, Verizon, IBM, Cisco, American Public Power Association, Siemens, Eaton, the European Association for International Education and Thrivent.